1. Why was Kaushik Basu, the ex-economic advisor to the Prime Minister of India, in news recently? Answer (d). At least 30% of the procurement of manufactured/processed products should be sourced from "small industries". 3. Which of the following institutions was/were asked by the Government of India to provide official estimates of black (unaccounted) money held by Indians, both in India and abroad? National Institute of Public Finance and Policy. National Institute of Financial Management. Answer (b). Effective is a new term introduced in the Union Budget of 2011-12. 6. Which one among the following is a fixed cost to a manufacturing firm in the short run? 7. What was Ziyarat in the language of the Sufis? place the remains of Yasser Arafat in a mosque compound. confirm the prevailing suspicion that Israel had poisoned him. Answer (b). The tomb of Yasser Arafat was primarily dug up to confirm the prevailing suspicion that Israel had poisoned him. The body was later shifted to a nearby mosque. 12. British colonialism in India saw the emergence of new cities. Calcutta, now Kolkata; was one of the first cities. 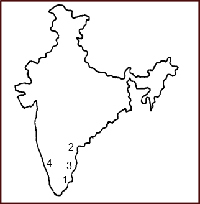 Which of the following villages were amalgamated to form the city of Calcutta? 17. Which type/types of pen uses/use capillary action in addition to gravity for flow of ink? 21. Which chemical was an important symbol in our struggle for freedom? 22. Which one among the following is responsible for the expansion of water in the ocean? Answer (a). Global warming is responsible for thermal expansion of sea water and carbon dioxide is chiefly responsible for global warming. 24. Which allotrope of carbon is in rigid three-dimensional structure? 25. What is the role of positive catalyst in a chemical reaction? 26. Why hard water does not give lather with soap? Hard water contains calcium and magnesium ions which form precipitate with soap. Hard water contains sulphate and chloride ions which form precipitate. pH of hard water is high. pH of hard water is less. 27. Which one among the following metals is used in fireworks to make a brilliant white light? Answer (a). Celsius, Fahrenheit scales are relative scales meaning their zeros have been arbitrarily defined. An absolute scale is one where zero is the lowest temperature possible. An absolute temperature scale with degree units the same as on Celsius scale is known as Kelvin scale and absolute scale using Fahrenheit degree units is known as Rankine scale.